Guerre d’Algérie : Mémoires de femmes par Béatrice Fainzang avec A.H.
Il y a 50 ans, le cessez le feu scel­lait l’indé­pen­dance de l’Algérie. Cinq femmes de Gironde témoi­gnent. 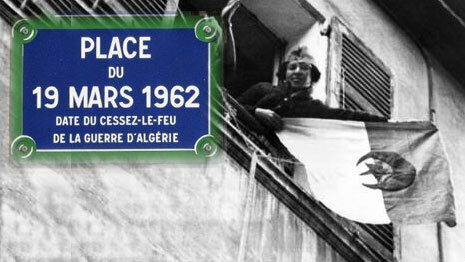 Le 19 mars 1962, les Accords d’Evian sont conclus met­tant fin à huit lon­gues années de guerre. Des deux côtés de la Méditerranée la guerre d’Algérie a fait des mil­liers de vic­ti­mes. Quand on parle de guerre, on pense aux hommes qui l’ont faite, aux com­bat­tants. Mais on oublie les femmes et les enfants, pour­tant vic­ti­mes indi­rec­tes. Aujourd’hui, la parole leur revient. Elles qui ont vécu le quo­ti­dien de cette guerre, long­temps restée taboue. Sadia, Khedaoudj, Dominique, Arlette et Zohra ont toutes les cinq vécu cette guerre en France ou en Algérie. Chacune se sou­vient d’un moment fort qui a marqué leur vie et qui révèle la com­plexité de cette guerre. Documentaire bri­tan­ni­que réa­lisé en 1989 sur le mas­sa­cre de My Lai, 1968. This short docu­men­tary exa­mi­nes Le Ly Hayslip’s pain­ful but ulti­ma­tely trium­phant jour­ney from a tragic child­hood in war-torn Vietnam to her new life as an American citi­zen and huma­ni­ta­rian. Produced by Palomar College Television. Do Thi Bay des­cri­bes her life as the daugh­ter of a poor pea­sant family and how, because they had no money and were exploi­ted, she began to follow the revo­lu­tion as a young girl. Do Thi Bay recalls her time as a cou­rier for the Viet Minh in 1946 car­rying let­ters and docu­ments across the vil­la­ges. Do Thi Bay des­cri­bes the time when French African troops broke into her house to search for incri­mi­na­ting mate­rials, and while the troops did not find any­thing they beat her before lea­ving. Former pros­ti­tute Duong Thi My Trung dis­cus­ses how she went to Saigon from the vil­lage of Soc Trang and began to earn money by smug­gling tax-free items such as American goods. Unfortunately res­tric­tions on the goods began to tigh­ten and as a result, Duong Thi My Trung lost her money. Finding work as a cashier, she explains how her mana­ger tri­cked her into pros­ti­tu­tion. Madame Duong Van Khang recalls being allo­wed to par­ti­ci­pate on an attack of the French mili­tary. Her job consis­ted of hel­ping move sol­diers safely to a place where they would be able to attack the enemy and then safely guide them home. Madame Duong Van Khang also des­cri­bes gathe­ring intel­li­gence on the French and pas­sing the infor­ma­tion along to the appro­priate people. She explains the dif­fe­rent dis­gui­ses she used in order to com­plete her tasks. Additionally, Madame Duong Van Khang talks about the expe­rien­ces of having to grow hemp for the Japanese ins­tead of rice, and the suf­fe­ring people expe­rien­ced due to not having the land avai­la­ble to grow food. H. Bot Adrong des­cri­bes her vil­lage’s pre­pa­ra­tion for, and par­ti­ci­pa­tion in, the Battle of Ban Me Thuot in 1975. Villager Hoang Thi Dan recalls hea­ring bombs being drop­ped from planes during the Christmas Bombings and the fear she felt while hiding in a nearby bomb shel­ter. Her house was des­troyed and one of her chil­dren was badly woun­ded, later dying at a nearby medi­cal sta­tion. She des­cri­bes burying her son and not being able to go home again. Villager Hoang Thi Thu talks about her hus­band going south to fight and sen­ding let­ters to him that recei­ved no res­ponse. She recalls the worry she felt for him and rela­tes her misery. In 1971 she heard that her hus­band had been killed in action. She des­cri­bes her pride in him but misses him pro­fu­sely. Jane Barton went to Vietnam with the American Friends’ Service Committee to work in a reha­bi­li­ta­tion clinic and to observe the treat­ment of pri­so­ners in Quang Ngai, South Vietnam. She des­cri­bes evi­dence of tor­ture and the com­pli­city of the American govern­ment. She des­cri­bes the dama­ges inflic­ted on Vietnamese civi­lians by relo­ca­tion pro­grams and by land­mi­nes. Finally, she dis­cus­ses the nega­tive atti­tu­des of the Vietnamese in her area towards the govern­ment of South Vietnam and the American pre­sence. 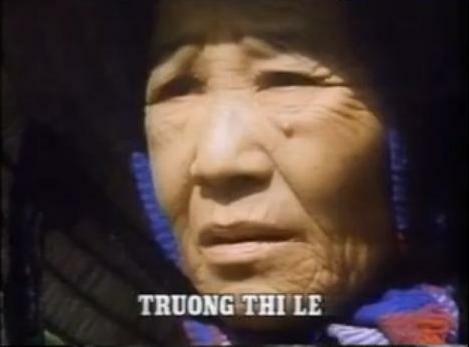 Le Thi Ma was a young girl during the Diem regime. She reports harsh treat­ment, forced labor, and lear­ning little at school other than how to salute the flag and sing the natio­nal anthem. She says she was pre­sent for the “Cedar Falls” search-and-des­troy ope­ra­tions by the Americans, during which the inha­bi­tants of Cu Chi dis­mant­led unex­plo­ded American bombs and recom­bi­ned the parts to create land­mi­nes, which they then used against American tanks and trucks. She recounts atta­cking Americans her­self from a fox­hole by deto­na­ting land­mi­nes along high­ways. Le Thi Ton was a Vietnamese vil­la­ger. She tes­ti­fies about a brutal, see­min­gly casual US assault on her hamlet on January 31, 1967 in which all ten mem­bers of her family were killed. On January 31st they came at around 12:00, exactly at 12:00. My family was on the outer part of the hamlet. And those other people were living in the middle sec­tion of the hamlet. We were only about a paddy field in dis­tance from each other. Ngo Ba Thanh was a consul­tant in inter­na­tio­nal com­pa­ra­tive law who spent years in jail in South Vietnam for her pro-Viet Cong views. She des­cri­bes going to mee­tings at the British Ambassador’s resi­dence as pre­si­dent of the International Women Association. The only Vietnamese woman atten­ding these diplo­ma­tic din­ners, she talks of diplo­mats, digni­ta­ries and mili­tary offi­cials being impres­sed by her for­thright views on poli­tics and the war. Nevertheless her outs­po­ken views, espe­cially those war­ning General William Westmoreland that the US would not suc­ceed in Vietnam, resul­ted in her deten­tion for over 2 years. As the sister-in-law of President Diem, Madame Ngo Dinh Nhu was consi­de­red the first lady of South Vietnam in the late 1950s through the early 1960s. Here she argues that the Diem govern­ment was the only legi­ti­mate govern­ment in South Vietnam, that they were under­mi­ned by the United States and that the United States, the­re­fore, paid a price. She dis­cus­ses the Buddhist Crisis of 1963 and the results of the Paris Peace Accords. 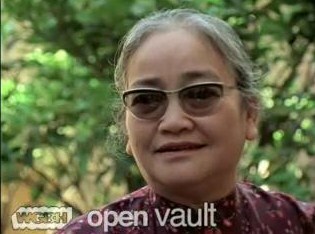 She reflects on Ngo Dinh Nhu and President Diem’s cha­rac­ters and her own repu­ta­tion as the “Dragon Lady” of Vietnam. Finally, she des­cri­bes the diplo­ma­tic efforts of Ngo Dinh Nhu towards North Vietnam and the arro­gance of the United States in inter­ve­ning. Mrs. Nguyen Cong Minh, a refu­gee from Hue, talks about the Communists laun­ching the 1968 battle for Hue during the New Year cele­bra­tions in the city. She remem­bers that the sound of gun­fire was being inters­per­sed with the sounds of fire­cra­ckers so no one at the time rea­li­zed that the Communists were over­run­ning the city. Nguyen Cong Minh remem­bers her father being taken away to a ree­du­ca­tion camp and never retur­ning, and her long search to find his remains in the mass graves of ree­du­ca­tion camp pri­so­ners. Madame Nguyen Thi Binh was the Foreign Minister of the National Liberation Front, and a repre­sen­ta­tive at the Paris peace talks. At the time of the inter­view, she was the Minister of Education of the Socialist Republic of Vietnam, and she later served for ten years as Vice President of the coun­try. In the inter­view she des­cri­bes life in colo­nial Saigon, joi­ning the Viet Minh, and the three years spent in a French prison. Mme. Binh then des­cri­bes her poli­ti­cal invol­ve­ment in the Provisional Revolutionary Government and the peace nego­tia­tions in Paris. Nguyen Thi Cao lived in the Vietnamese vil­lage of Cam Ne, near the city of Da Nang. She des­cri­bes the American des­truc­tion of that vil­lage in August 1965, and the chaos as the Americans chased and killed many of the vil­la­gers, inclu­ding her daugh­ter. Nguyen Thi Chiem was a South Vietnamese vil­la­ger whose hus­band and chil­dren were killed at various points during the Vietnam War. She des­cri­bes the many hard­ships people faced under the rule of Ngo Dinh Diem, and the deaths of her family mem­bers “by American bombs and shells.” She notes that it was because of Diem’s repres­sive poli­cies that vil­la­gers sup­por­ted the revo­lu­tion. Nguyen Thi Dinh was a Deputy Supreme Commander of the National Liberation Front. Following the war, Madame Dinh served on the Central Committee of the Vietnamese Communist Party and became the first female Major General of the Vietnam People’s Army. She des­cri­bes in detail her acti­vi­ties against the French, and her sub­se­quent arrest and tor­ture. She then details the repres­sions suf­fe­red under Ngo Dinh Diem, the Tet Offensive, the Phoenix Program, and the fall of Saigon. Nguyen Thi Duc sur­vi­ved the “Christmas Bombing” of Hanoi in 1972. She des­cri­bes the shock of the event and the shel­ter col­lap­sing on her. When she reco­ve­red, Ms. Duc was angui­shed to find out that seve­ral family mem­bers had been killed in the attack. Nguyen Thi Hoa was a gue­rilla figh­ter for the National Liberation front as a tee­na­ger in the 1960s. She des­cri­bes how she pre­pa­red the for the NLF inva­sion of Hue during the Tet Offensive. Ms. Hoa then details her par­ti­ci­pa­tion in and the gene­ral atmos­phere of the fero­cious battle of Hue. Nguyen Thi Mai was the head of the School for New Women in Saigon. She des­cri­bes how the pre­sence of American troops in Saigon cor­rup­ted the youth and led to many young women beco­ming pros­ti­tu­tes. She recounts the story of one girl who was unable to stop her pros­ti­tu­tion after the war, but then atten­ded Ms. Mai’s school and is now back in her native vil­lage. Nguyen Thi Ngo des­cri­bes poli­ti­cal and eco­no­mic repres­sion under the Ngo Dinh Diem regime. She recalls in the women of her vil­lage hel­ping Viet Cong sol­diers with food and first aid during the Battle of Ap Bac. Nguyen Thi Nguyet Anh worked for the National Liberation Front in Da Nang. She recalls her arrest 1963 and again in 1966, both of which resul­ted in impri­son­ment and nightly tor­ture under the Ngo Dinh Diem regime. She des­cri­bes the tor­ture tac­tics and recalls American mili­tary offi­cers pre­sent. Finally, she recounts the libe­ra­tion of Da Nang and the cele­bra­tions that fol­lo­wed. Nguyen Thi Sinh des­cri­bes the women of her vil­lage pro­tes­ting against the forced labor of their hus­bands in Ngo Dinh Diem’s agro­ville or “Strategic Hamlet” pro­gram. She recalls being arres­ted and beaten as a result of the pro­test. Finally, she des­cri­bes her atti­tude toward the Diem regime and the National Liberation Front. Nguyen Thi Te des­cri­bes the bur­ning of her vil­lage by American sol­diers. She recalls being beaten and raped by Americans along with other people from her vil­lage. Nguyen Thi Thiep recounts American sol­diers bur­ning the vil­lage of Cam Ne, inclu­ding her house, 1965. She des­cri­bes being filmed by a film crew and later being forced to leave her home and live in a ree­du­ca­tion camp. Nguyen Thi Trong recounts the forced relo­ca­tion of her vil­lage, Thanh-tuyen, by American troops in 1966. She des­cri­bes aban­do­ning all of her belon­gings and her home to endure life in the relo­ca­tion camp where many of her chil­dren died. She recalls American mili­tary pro­mi­ses of sup­port for relo­ca­ted Vietnamese that were not always hono­red. Dr. Pham Thi Xuan Que lived in a vil­lage in South Vietnam under the lea­der­ship of Ngo Dinh Diem. She des­cri­bes many of the repres­sive tac­tics used by Diem’s secret police, inclu­ding various forms of tor­ture. Dr. Que tells of how the National Liberation Front enjoyed wides­pread sup­port within Hue, and of the events sur­roun­ding the NLF’s cap­ture and sub­se­quent eva­cua­tion of Hue during the Tet Offensive. 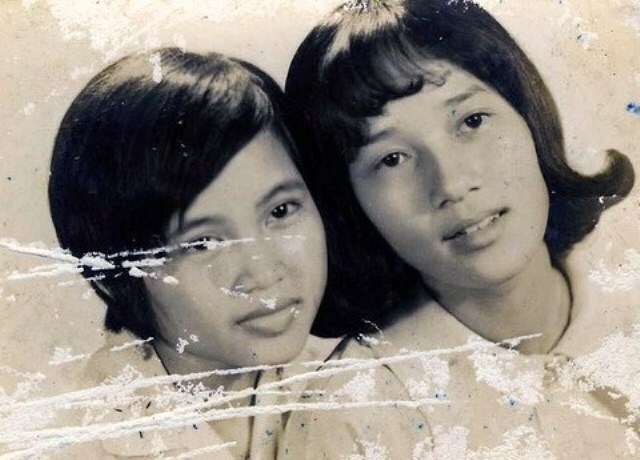 Phung Thi Tiem was a fac­tory worker who sur­vi­ved the “Christmas Bombing” of Hanoi in 1972. She des­cri­bes the bombs explo­ding just as she and her family ente­red the shel­ter and kno­cking her uncons­cious. Ms. Tiem then tells of lea­ving the shel­ter with her family to aid in the rescue efforts. Because houses had col­lap­sed atop the bomb shel­ters there were many people trap­ped. She and others worked for “5 or 6” days just trying to get to those people. She recalls her most pain­ful memory of the event : the sight of an entire family of seven dead among the ruins of their flat­te­ned house. Thuong Thi Mai, a Vietnamese vil­la­ger from Thuy Bo, des­cri­bes American sol­diers shoo­ting her family and bur­ning and des­troying her vil­lage. On the 31st, the Americans came. When they came, we were in the house. They ente­red the house and pushed us back­ward. When we could not go back any fur­ther they shot my father, my mother, my sister in law and a niece. They killed three per­sons in the cour­tyard and shot my mother in the house. Thu Van went to North Vietnam to study film­ma­king after the Geneva Agreements. She des­cri­bes fil­ming during the Vietnam war, com­ments on the vio­lence, and dis­cus­ses docu­men­ting the final days of the war as the Americans pulled out and the South Vietnamese fled. Finally, she recalls her reu­ni­fi­ca­tion with her family after a 20-year sepa­ra­tion. Tran Thi Giai des­cri­bes American troops roun­ding up people in her vil­lage to send them to relo­ca­tion camps. Tran Thi May dis­cus­ses the role of Vietnam’s intel­lec­tual class in resis­ting Ngo Dinh Diem’s regime. She recalls being chased by the secret police, esca­ping to Cu Chi, and tra­ve­ling to and from Saigon in dis­guise. She also des­cri­bes sur­vi­ving the devas­ta­tion of Cu Chi during Operation Cedar Falls. Tran Thi Truyen des­cri­bes her trek down the Ho Chi Minh trail in 1971 to build a field hos­pi­tal. At 16 years old, she and other women built and staf­fed the hos­pi­tal for woun­ded sol­diers. She recounts the hor­rors she wit­nes­sed during her work. Former NLF sol­dier Tran Thi Tuyet talks about the agro­vil­les and her daily life. She recalls that life was rela­ti­vely quiet until the agro­vil­les were built under Ngo Dinh Diem as part of the Rural Community Development Program to for­ci­bly relo­cate sec­tions of the popu­la­tion. She talks about vil­la­ges being des­troyed so an agro­ville could be cons­truc­ted. The popu­la­tion suf­fe­red and life became hard. The civi­lians began to revolt and deman­ded that their land be retur­ned to them. In the begin­ning the upri­sing was popu­lar and many people would join in order for life to return to normal. Tran Thi Tuyet also recalls that when the agro­vil­les were dis­mant­led in 1960 a second upri­sing occur­red and people rushed back to gain control of their former homes. Tran Thi Tuyet dis­cus­ses why she joined the NLF, as it was the only way not to remain in the agro­vil­les fore­ver. A true story of a family in search of free­dom. They strug­gled, sur­vi­ved and ulti­ma­tely live the American Dream. By Lan Dalat 2009. Phan Thị Kim Phúc (born 1963) is a Vietnamese-Canadian who is the sub­ject of a famous photo from the Vietnam War. The photo shows her at about age nine run­ning naked on the street after being seve­rely burned on her back by a South Vietnamese napalm attack. The photo was taken by AP pho­to­gra­pher Nick Út. Uỷ Ban Báo Nguy Giúp Người Vượt Biển (Boat People S.O.S. Committee) phát hành năm 1985. Nhóm thực hiện : Tiến Sĩ Nguyễn Hữu Xương, Nhà Văn Phan Lạc Tiếp, Nhà Văn Nhật Tiến, Ký Giả Dương Phục, Ký Giả Vũ Thanh Thủy, Ông James Banerian, Ông Huỳnh Văn Hay cùng sự cộng tác : Khánh Ly, Ban Thùy Dương, TG Recording Studio, SoundTech Recording Studio. Trình Bày : Nhà Văn Lê Tất Điều. Chaque his­toire éclaire un aspect spé­ci­fi­que du drame. Esmija raconte com­ment en 1992, à Foca, elle a été séques­trée et violée devant ses enfants : « J’avais honte de regar­der mon fils dans les yeux », dit-elle. Dika et Nuska retour­nent au tris­te­ment célè­bre camp d’Omarska. Torture, exé­cu­tions, viols : Omaska était un véri­ta­ble camp d’exter­mi­na­tion. Les deux amies, qui ont été séques­trées ensem­ble, racontent les sévi­ces, les humi­lia­tions dont elles ont été vic­ti­mes. Elles racontent aussi les vio­len­ces sexuel­les for­cées entre des hommes, par­fois entre un père et un fils. Un homme aussi témoi­gne. Si Edo parle, c’est que sa femme ne peut plus le faire. D’ori­gine alle­mande, elle s’est sui­ci­dée après avoir été violée. Murée dans le silence, « elle n’a pas pu sup­por­ter la vie après ». À tra­vers son témoi­gnage, on com­prend que cette poli­ti­que visait aussi les cou­ples mixtes. Enfin, il y a Jasna, dont les deux enfants ont été tués et jetés dans un char­nier : « Je pou­vais tout ima­gi­ner : les tue­ries, les viols, qu’ils ont tué mon mari... Mais qu’ils tuent des enfants, cela n’a pas pu ren­trer dans ma cons­cience. » Jasna veut témoi­gner car toutes les autres femmes qui ont été déte­nues avec elles sont mortes. Face à ces témoi­gna­ges venus de l’ex Yougoslavie : les visa­ges impas­si­bles et les décla­ra­tions sans remords des bour­reaux inculpés devant le Tribunal pénal inter­na­tio­nal de La Haye. Les accu­sés com­pa­rais­sent pour viols sys­té­ma­ti­ques, viols sur enfants de 12 ans, géno­cide... Au-delà des his­toi­res per­son­nel­les, ce film émouvant et dur lève le voile sur les res­sorts poli­ti­ques de ces viols uti­li­sés comme arme de guerre. Face à la guerre, face à la vio­lence, face à la misère, face à la dis­cri­mi­na­tion, face à l’igno­rance ou à la mala­die. Women and War vous pro­pose de décou­vrir chaque mois le combat dif­fi­cile de femmes enga­gées à tra­vers le monde. Women, War & Peace pre­mie­red on your local PBS sta­tion Tuesday nights from Oct. 11 to Nov. 8, 2011. Women, War & Peace is a bold new five-part PBS tele­vi­sion series chal­len­ging the conven­tio­nal wisdom that war and peace are men’s domain. The vast majo­rity of today’s conflicts are not fought by nation states and their armies, but rather by infor­mal enti­ties : gangs and war­lords using small arms and impro­vi­sed wea­pons. The series reveals how the post-Cold War pro­li­fe­ra­tion of small arms has chan­ged the land­scape of war, with women beco­ming pri­mary tar­gets and suf­fe­ring unpre­ce­den­ted casual­ties. Yet they are simul­ta­neously emer­ging as neces­sary part­ners in bro­ke­ring las­ting peace and as lea­ders in for­ging new inter­na­tio­nal laws gover­ning conflict. With depth and com­plexity, Women, War & Peace spot­lights the sto­ries of women in conflict zones from Bosnia to Afghanistan and Colombia to Liberia, pla­cing women at the center of an urgent dia­lo­gue about conflict and secu­rity, and refra­ming our unders­tan­ding of modern war­fare. Featuring nar­ra­tors Matt Damon, Tilda Swinton, Geena Davis and Alfre Woodard, Women, War & Peace is the most com­pre­hen­sive global media ini­tia­tive ever moun­ted on the roles of women in war and peace. The series will pre­sent its ground­brea­king mes­sage across the globe by uti­li­zing all forms of media, inclu­ding U.S. and inter­na­tio­nal pri­me­time tele­vi­sion, radio, print, web, and world­wide com­mu­nity scree­nings, and will be accom­pa­nied by an edu­ca­tio­nal and outreach ini­tia­tive desi­gned to advance inter­na­tio­nal accoun­ta­bi­lity in regard to women and secu­rity. Women, War & Peace is a co-pro­duc­tion of THIRTEEN and Fork Films. I Came to Testify is the moving story of how a group of 16 women who had been impri­so­ned and raped by Serb-led forces in the Bosnian town of Foca broke his­tory’s great silence – and step­ped for­ward to take the wit­ness stand in an inter­na­tio­nal court of law. Their remar­ka­ble cou­rage resul­ted in a trium­phant ver­dict that led to new inter­na­tio­nal laws about sexual vio­lence in war. Pray the Devil Back to Hell is the asto­ni­shing story of the Liberian women who took on the war­lords and regime of dic­ta­tor Charles Taylor in the midst of a brutal civil war, and won a once uni­ma­gi­na­ble peace for their shat­te­red coun­try in 2003. When the U.S. troop surge was announ­ced in late 2009, women in Afghanistan knew that the ground was being laid for peace talks with the Taliban. Peace Unveiled fol­lows three women in Afghanistan who are ris­king their lives to make sure that women’s rights don’t get traded away in the deal. The War We Are Living tra­vels to Cauca, a moun­tai­nous region in Colombia’s Pacific sou­th­west, where two extra­or­di­nary Afro-Colombian women are bra­ving a vio­lent strug­gle over their gold-rich lands. They are stan­ding up for a gene­ra­tion of Colombians who have been ter­ro­ri­zed and for­ci­bly dis­pla­ced as a deli­be­rate stra­tegy of war. War Redefined, the caps­tone of Women, War & Peace, chal­len­ges the conven­tio­nal wisdom that war and peace are men’s domain through inci­sive inter­views with lea­ding thin­kers, Secretaries of State and sea­so­ned sur­vi­vors of war and peace-making. Interviewees include Secretary of State Hillary Clinton ; Liberian peace acti­vist Leymah Gbowee ; Bosnian war crimes inves­ti­ga­tor Fadila Memisevic ; and glo­ba­li­za­tion expert Moisés Naím.